Plant-soil feedback (PSF) describes the process whereby plant species modify the soil environment, which subsequently impacts the growth of the same or another plant species. Our aim was to explore PSF by two maize varieties (a landrace and a hybrid variety) and three arbuscular mycorrhizal fungi (AMF) species (Funneliformis mosseae, Claroideoglomus etunicatum, Gigaspora margarita, and the mixture). We carried out a pot experiment with a conditioning and a feedback phase to determine PSF with different species of AMF and with a non-mycorrhizal control. Sterilized soil was conditioned separately by each variety, with or without AMF; in the feedback phase, each soil community was used to grow each in its “home” soil and in the “away” soil. 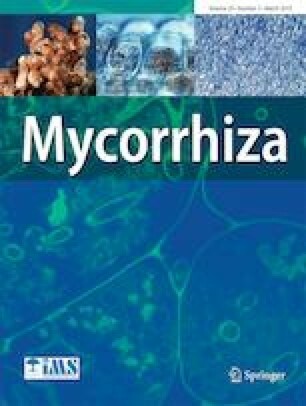 Plant performance was assessed as shoot biomass, phosphorus (P) concentration and P content, and fungal performance was assessed as mycorrhizal colonization and hyphal length density. Both maize varieties were differentially influenced by AMF in the conditioning phase. In the feedback phase, PSF was generally negative for non-mycorrhizal plants or when plants were colonized by G. margarita, whereas PSF was positive in the other three AMF treatments. When plants were grown on home soil, hyphal length density was larger than on away soil. We conclude that different maize varieties can strengthen positive plant-soil feedback for themselves through beneficial mutualists for themselves, but not across the maize varieties. The online version of this article ( https://doi.org/10.1007/s00572-019-00885-3) contains supplementary material, which is available to authorized users. We are grateful to editor David Janos and two anonymous reviewers for constructive criticism on an earlier version of this manuscript. This study was financially supported by the National Natural Science Foundation of China (U1703232) and National Key R&D Program of China (2017YFD0200200).